At 18 kilometres altitude, the cabin pressure relief valve was set for entry. In this mode, the valve held the cabin pressure at its nominal value until the outside pressure rose to a slightly higher level, at which point outside air would begin to flow into the cabin. On the main display console in front of the CMP and commander was a small altimeter whose needle now responded to the rising air pressure outside, allowing the crew to use its information to check the progress of the descent. In preparation for the intensive sequence of pyrotechnic events to come, the SECS was again armed, giving the crew the option of dealing with a possibly unstable plummeting spacecraft by manually deploying the drogue chutes early. Ten kilometres up and falling, they switched on the logic system that would automatically trigger the components of the Earth landing system. It used timers and barometric switches to orchestrate the deployment of a series of parachutes and other events to bring the command module to a safe meeting with the ocean's surface. They also threw a switch to finally disable the RCS thrusters. Next, 7,300 metres up and descending at over 150 metres per second, a barometric switch operated to jettison the upper section of the conical heatshield, commonly referred to as the apex cover. 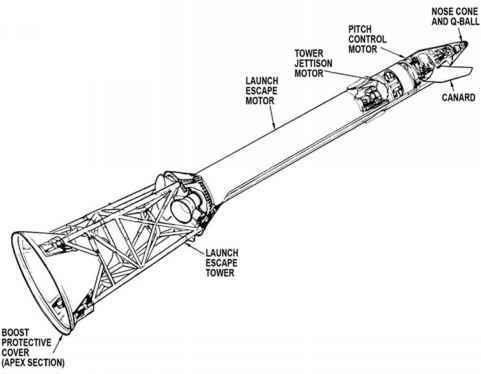 Four gas-operated pistons pushed it off and a small parachute attached to it slowed it down to take it away from the descending command module. This revealed the main parachutes packed around the tunnel and two canisters containing the drogue chutes. As with all the automatic events about to occur over the next few minutes, a guarded pushbutton allowed the crew to deploy the apex cover should the automatic system fail. Once the apex cover had enough time to clear, 1.6 seconds to be exact, two drogue chutes were fired away from the spacecraft by pyrotechnic mortars to ensure that they avoided the turbulent airflow directly above the plummeting spacecraft. "Stand by for the drogues,'' called Young as Charlie Brown continued descending. "Stand by. There went something,'' said Stafford. These parachutes were designed to reduce the CM's descent speed to 80 metres per second. By now, the crew expected to see their cabin pressure rise as the planet's air began to flow in from outside via the cabin pressure relief valve. If not, the crew could set the cabin pressure relief valve to its dump position.